We are back at home, luggage is unpacked and we are shifting back to our normal daily routine. Only slowed down slightly by my eldest daughter having caught a stomach bug. Fortunately the bug left as quickly as it came and tomorrow its back to normal daily business. I’ve just finished reading Written in My Own Heart’s Blood by Diana Gabaldon and thats left little time for stitching. 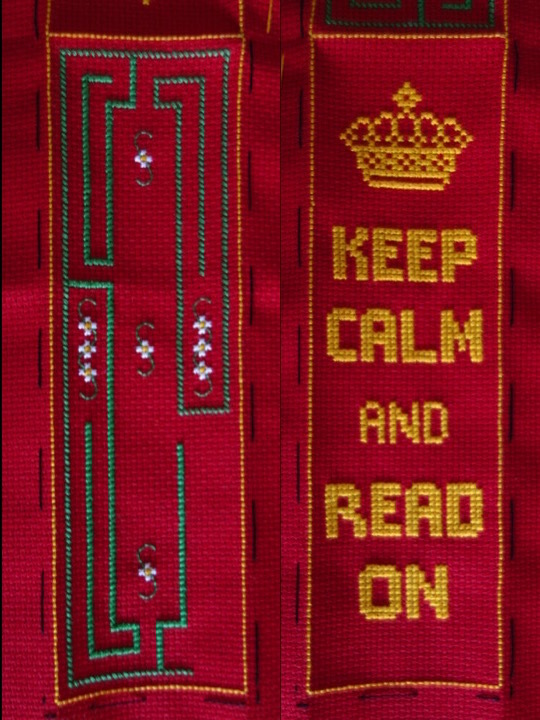 There has been some progress on my Keep Calm bookmark despite my compulsive reading over the past couple of weeks. The front of the bookmark is finished, I am happy with the design but need to adjust its placement in the chart. I am now working on the back, which is a garden labyrinth. I’ve come to the conclusion that the 2 don’t go together as well as I would like, so if I release this as a chart for other people to stitch I am likely to come up with something else for the back. However, I can not tell you how much fun it is to stitch the labyrinth… I can not wait for this evening to get back to it.